Stereophonics have announced they're going to perform at Thetford Forest this summer. They'll perform as part of the Forest Live music series on Sunday 23 June. Income generated from ticket sales helps look after the forest. Paul Weller is the first artist to announce gigs as part of Forest Live 2019 summer concert series including Thetford Forest. 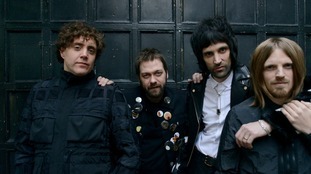 Kasabian have announced they will be playing at Thetford Forest in Norfolk next year. The rock band are taking part in the Forest Live 2018 concert series in June. Other musicians performing in the series include Gary Barlow, The Script and Paul Heaton & Jacqui Abbott. Tickets will go on sale this Friday and will cost £46. Irish three-piece The Script will return to Thetford Forest for the fourth time next summer - having been announced as the latest act in the annual concert series. The Dublin band will perform as part of Forest Live, appearing at the Suffolk venue on June 7. “We love performing as part of Forest Live. It will be our fourth trip to Thetford Forest. We hope you can join us to rock in this unique atmosphere." – Danny O'Donoghue, The Script frontman. The Script recently celebrated scoring their fourth UK number one album and have sold more than 29 million records since releasing their eponymous debut album in 2008. Fans can look forward to hearing hits including The Man Who Can Be Moved, Hall of Fame, and Rain during the gig next summer. The Script is the third act to be announced for Forest Live 2018. Gary Barlow's appearance on June 8 has already sold out while former Beautiful South stars Paul Heaton and Jacqui Abbott will perform on June 9. Garry Barlow will take part in Forest Live 2018, an annual summer concert series in Suffolk, organised by the Forestry Commission. Fire crews are at the scene of a large fire in Thetford Forest. Credit: ITV News Anglia. Firefighters are tackling a large blaze in Thetford Forest. Five fire engines are at the site at Santon Downham, near Brandon. Crews have reported the area, which covers about 800 sq m of undergrowth, is well alight. The foal was spotted by a local farmer and is now being cared for by a Norfolk charity. Bomb disposal experts have carried out a controlled explosion at Thetford Forest on the Norfolk / Suffolk border after a 500 pound bomb and live mortar shell were found. Bomb disposal experts are getting ready to carry out a control explosion at Thetford Forest on the Norfolk and Suffolk border after a 500 pound bomb and live mortar shell were found. The devices were discovered at 12.30 yesterday afternoon in the forest, near the B1106. Police have a one mile cordon in place around the bomb. Elbow are the latest band to announce they will be playing Thetford Forest this summer.